She’s a member of three D.C.-area bands: psychedelic rock group Pagan Reagan, shoegazey Sonic Eddy and all-female rock group The OSYX. She recently co-founded a nonprofit record label. She’s a visual artist whose designs have been purchased by Gap and Catoctin Creek Distilling Co. And, on a recent Friday morning at an Arlington coffee shop, she was game to discuss it all—even launching into a saw-playing tutorial once I expressed interest in the instrument. Renfro, who grew up in Falls Church (she recently moved to Maryland), began performing as a solo artist in high school. She was an orchestra member at George C. Marshall High and taught herself enough guitar to perform at local open mics, including Stacy’s Coffee Parlor, where Spacebar now stands. Yet the 30-year-old multi-instrumentalist (vocals, violin, piano, guitar, bass guitar, baritone guitar, saw) is not someone who lives for the limelight. “I really like writing music, and performing, to me, is secondary, even though I’m right now in many groups performing all the time,” she says. 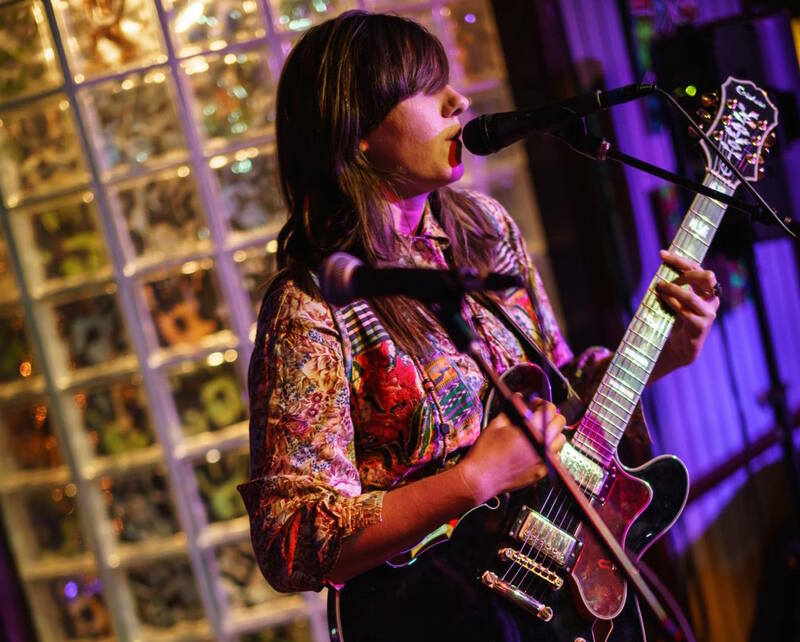 Her newest band, Sonic Eddy, has played Union Stage, Epicure Cafe and house shows, and comes to Galaxy Hut on Sunday, November 25. The group—Renfro (songwriter, lead vocalist, guitars), Lily Cousland (clarinet, vocals, guitar), Evan O’Neal (bass, guitar; also a member of Pagan Reagan) and Nikhil Rao (drums)—has recorded and released only one song thus far, the anguished “Value of Love,” but plans to release its first EP next spring. Renfro says that the band’s somewhat muted sound is a departure from the bold, politically oriented music of Pagan Reagan. On Renfro’s 2012 EP, houseplant, the artist sings passionately about unrequited love, hopelessness and other life struggles that were all too common for someone who was then in her mid-20s. Her poetry is conversational (“Wish I was a mockingbird/ High up in a tree/ Then I’d be safe from my own words/ And you’d be safe from me”), opting at times for the stream-of-consciousness approach she says she favors. 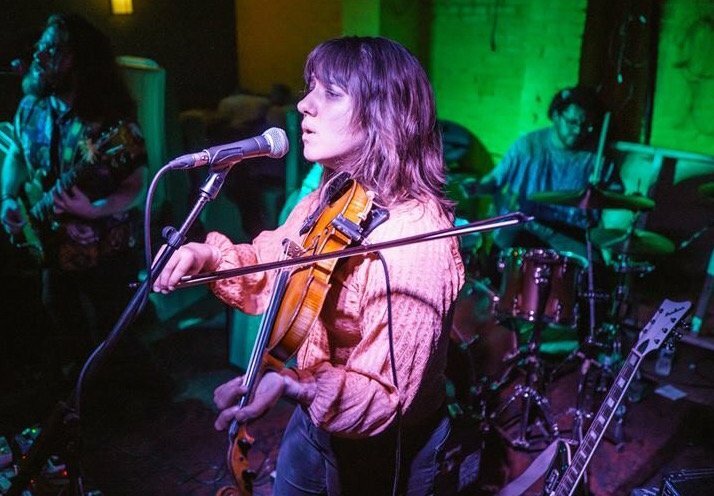 Renfro leans toward a “psychedelic country” sound with Sonic Eddy, which she notes may be a byproduct of spending eight years in Blacksburg, Virginia, and having family members from Appalachia. (She tells me via email that her “grannies” grew up in an area of Tennessee that is now part of Great Smoky Mountains National Park.) She took fiddle lessons as a teenager with legendary Arlington violinist Roy Odell “Speedy” Tolliver (who passed away last year) and recorded her solo EP with help from fellow fiddler, vocalist and roommate Anna Roberts-Gevalt, one half of folk duo Anna and Elizabeth. Renfro earned her fine art degree from Virginia Tech and was on campus during the 2007 mass shooting that left 33 dead. Her song “No Angels, Only Demons,” slated to be released within the next few months, was penned in response to rampant gun violence. “Essentially, every single time there’s a shooting … I’m always reflecting, forced to reflect on this event that happened, over and over and over,” she says. This fall, Renfro and co-founders launched This Could Go Boom! Records after winning a crowd-favorite award from micro-grant organization The Awesome Foundation and raising more than $13,000 on the crowdfunding website Indiegogo. The nonprofit label’s founders are members of The OSYX—a sort-of supergroup comprised of members of other D.C.-area bands, including Fuzz Queen and RadaR—and The OSYX is the label’s first band. Operating with the tagline “Your Soundtrack for Destroying the Patriarchy,” the label aims to promote “under-represented and gender diverse” groups. It has hosted a monthly showcase at the Dew Drop Inn since the late summer, with its next performance set for December 21. In meeting her, she certainly seems nothing like a brand, and every bit like a friendly acquaintance you’d like to get to know better. Arlington Playlist is a monthly music feature spotlighting local artists. Eliza Berkon is a freelance features writer and musician. She taught K-6 music for five years in Virginia and currently performs as a jazz vocalist. Her work has appeared in The Washington Post, DCist, Northern Virginia Magazine and Arlington Magazine.